France to introduce bike registration plates that exceed all sizes ! Last week, we exposed on this site one of the most stupid pieces of legislation that we had ever come across, which consists of forcing all bikers in France to wear a high visibility fluorescent vest in an attempt to reduce the number of accidents involving motorcyclists. The government hopes that by making bikers more visible on the roads, but also by failing to dispense adequate training and awareness courses to both bikers and car drivers, road users will drive or ride more safely and help reduce the number of accidents. According to the headless chickens that govern France nowdays, as long as the bikers wear a high visibility jacket while riding, they can be totally naked underneath that jacket and still ride safely and legally (click here to read last week’s post). Well, unfortunately that was only part 1 of the story because the same French authorities have also come up with plans to force all bikers to replace their registration plate for a bigger one to make it more visible… again in an attempt to reduce the number of accidents involving motorcyclists. How can a larger registration plate help reduce accidents? 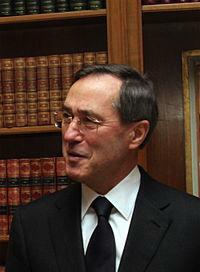 Get yourself stronger glasses, Mr Guéant, these ones are obviously not strong enough for you! Claude Guéant (left), French interior minister, is the one who has come up with yet another stupid idea that is only there to catch hundreds of bikers a day who ride bikes with registration plates that don’t comply with the new regulations. Can you see how the French government is only interested in ticketing bikers rather than investing money in training road users to indeed reduce the number of accidents? By forcing all bikers to change their registration plates, can you imagine the amount of cash the government is about to collect as a result? And that’s what they want from the bikers, their hard earned money, that is! 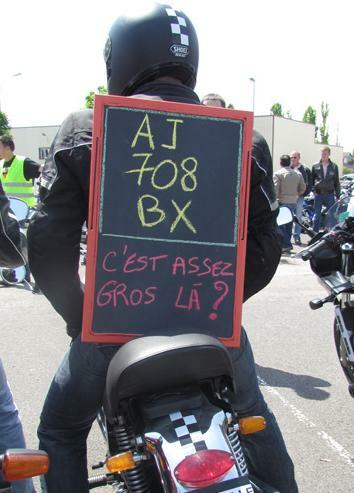 It doesn’t make any sense to impose a new size of registration plates for the sake of reducing the number of casualties, so how can the French government be so naive and think that the bikers are going to accept this non-sense spin? The Fédération Française des Motards en Colère (FFMC – French Federation of Angry Bikers) has been organising enormous protests in all cities and towns nationwide to not only express their anger and disgust at their government who keeps coming up with money-grabbing tactics such as the one above, but also to protest at their government’s inability to introduce effective measures to increase safety and motorcycle awareness among all road users. Is this plate big enough for Mr Claude Guéant, French interior minister? Can he read it or should he pay a visit to the opticians to get a stronger prescription? In a recent protest in the town of Troyes, a number of bikers turned up with the largest registration plate one can possibly imagine (left) to ask the government whether it is big enough for their stupid and blind eyes. “Is this registration plate large enough for you, Mr Guéant, or do you want it to be even larger so that you may be able to clearly see it?”, shouted the angry bikers while demonstrating en masse and causing chaos on the roads during rush hour. 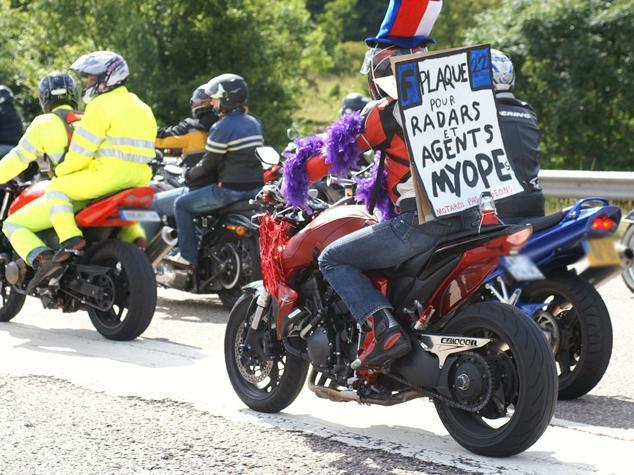 “Perhaps Mr Guéant should pay a visit to the opticians more often and be prescribed appropriate glasses to correct his poor vision, that way he would be able to read the details on the existing registration plates!”, shouted other furious bikers along the way. What about this one, is Mr Guéant able to read or is it still not big enough for him? A series of demonstrations are currently taking place all over France with a massive and enormous national protest scheduled for 18th June 2011, which is expected to be attended by more than 100,000 bikers nationwide. We can expect to see the whole nation brought to a complete standstill by the bikers, as we have seen it many times before! Do you fancy a trip to France to see for yourself how the French behave when they are angry? Don’t forget to bring with you a large registration plate such as the one shown above to find out whether Mr Guéant’s vision is good enough to read foreign registration plates! it’s about time the fight-back got serious.we need to kick these self serving politicians right where it hurts! « France completely paralysed by almost 100,000 bikers !